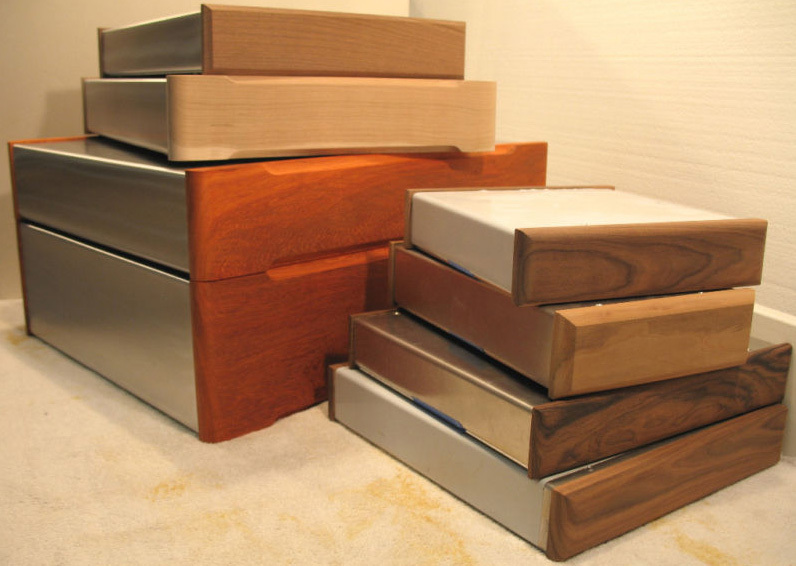 Very sad news, Keith Michael Kirby, the maker of very fine custom audio chassis, passed away on Tuesday, Dec. 25. Per the Albany Democratic Herald, Keith passed away peacefully at his home at the age of 50. Keith made it possible for many in the DIY community to build beautiful tube amps with his custom chassis. 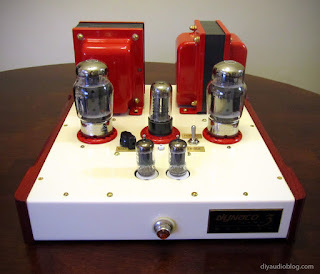 Without Keith I would have never been able to complete my projects like this Dynaco mkIII monoblock amplifier below. He was always extremely friendly and he had a great passion for audio. It saddens me greatly that we won't be able to discuss our personal projects any longer. The DIY community simply won't be the same without his great contributions. May he rest in peace. 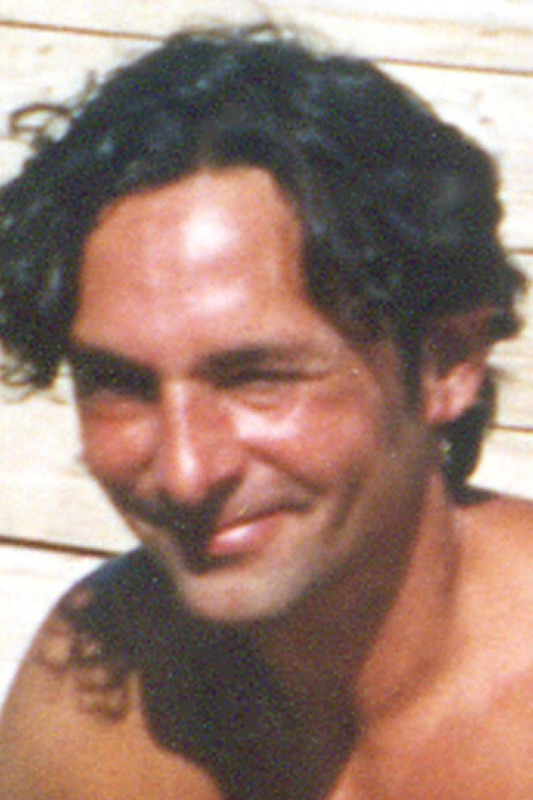 Contributions in memory of Keith may be made to SafeHaven Humane Society, P.O. Box 2018, Albany, OR 97321. A subwoofer only reproduces a limited range of audio in your system, most likely a frequency range within 20Hz and 100Hz. 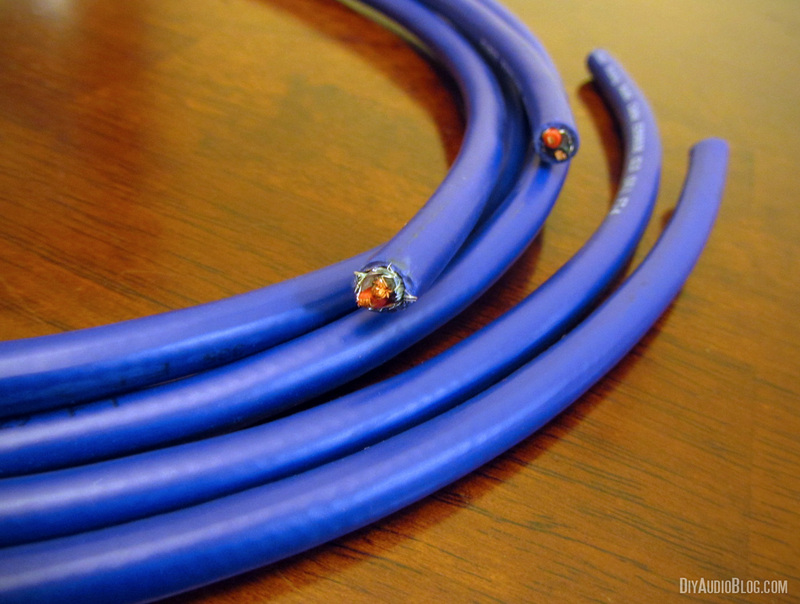 With this being said, subwoofer cables aren't as critical as the interconnects responsible for a much wider range (in my humble opinion). 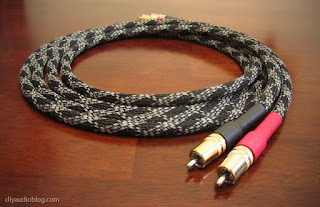 So, if you're weighing the benefits of subwoofer cable versus a pair of interconnects between your CD player and amp, I'd say go with the interconnects first. Still, as audio enthusiasts, we can't simply ignore our poor subwoofers, can we? 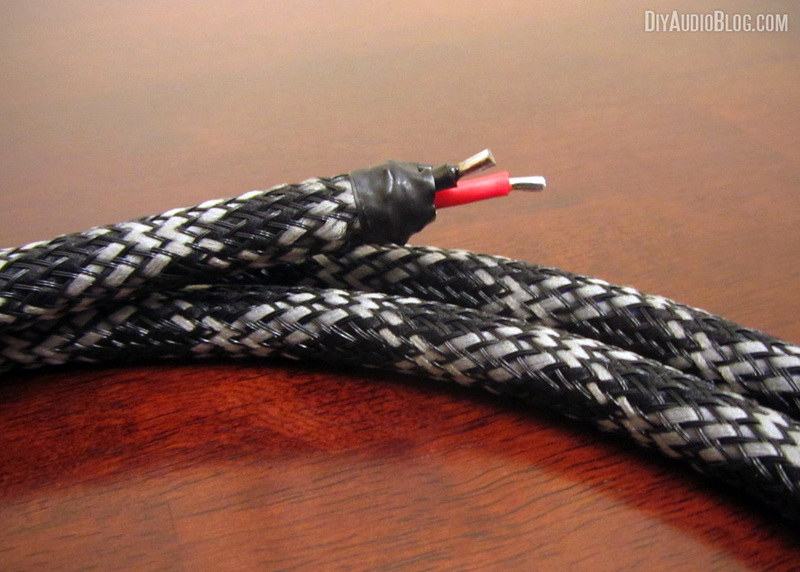 Today I will be assembling a pair of subwoofer cables from Furez FZ162AA audio cable. 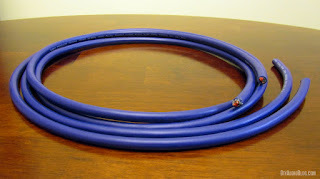 This is a reasonably priced cable that features thick 16 gauge oxygen-free copper conductors (99.997% pure, aka 4Ns), a very adequate foamed polyethylene dielectric and a dual-shield (tinned copper braid and a aluminum foil wrap) to help protect against EMI/RFI interference. I'll also be using some Furez FZ100BS black and grey sleeving to dress up the cable a bit, and a set of Cardas GRMO Rhodium over silver-plate RCAs. The cable itself is nice and thick, thicker than the Cardas Crosslink 1i interconnect cable. Taking a look a little closer, you'll notice the thick 16 gauge copper conductors. 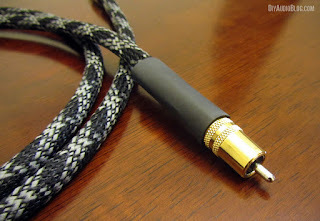 Normally audiophile interconnects are between 20 and 24 gauge, so this is a bit thicker than typical and thus will have additional capacitance (Capacitance @ 1KHz: 20.86 pF/ft). 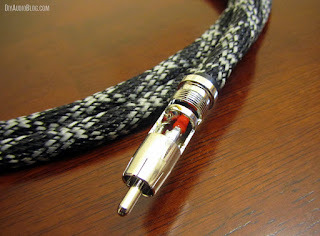 One could even use it for a speaker cable at this thickness. 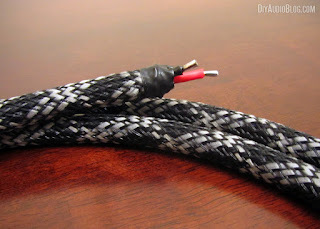 Whether or not this will be beneficial when used as a subwoofer cable remains to be seen. 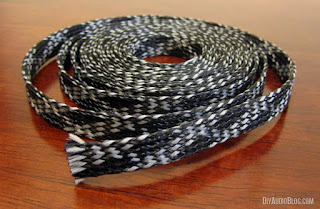 As mentioned above, I'll be using some Furez FZ100BS black and grey sleeving to dress up the cable. 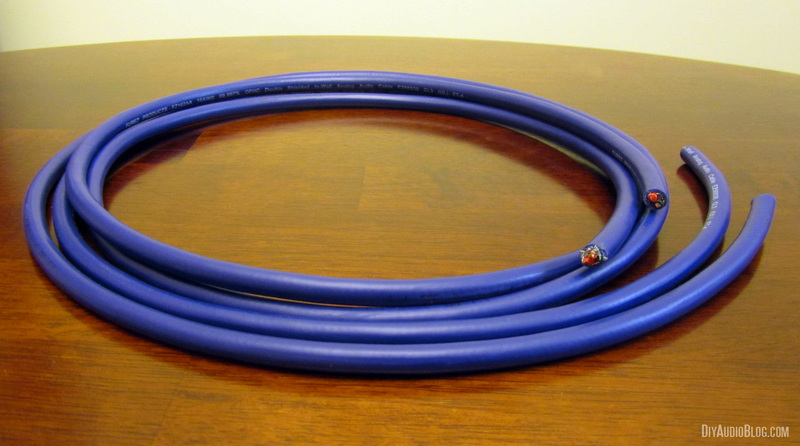 This sleeving is made specifically for Furez products by ViaBlue. 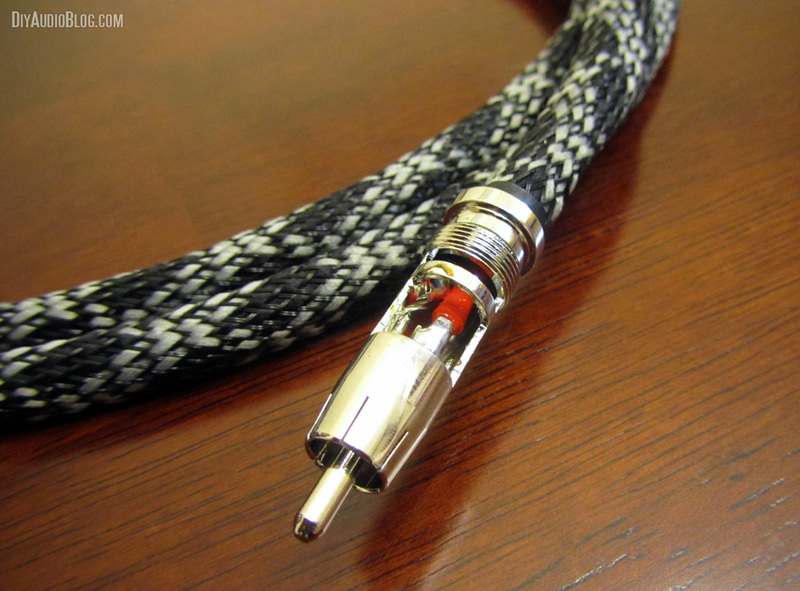 To see some of ViaBlue's bling, check out this mini to RCA cable made using their products. 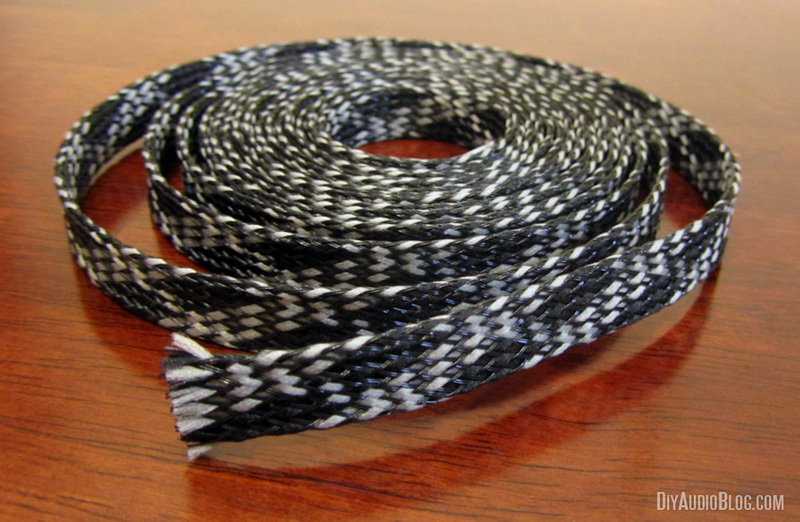 The FZ100BS is made from Monofilament Polyethylene Terepthalate (PET) and Fiber Fillers. Do note that a hot knife is needed to cut the sleeving, otherwise it will fray, as you will see in the image above. The hot knife melts the sleeving together and prevents this. Also note that as you sleeve the cable, you will lose some length as the sleeving is expanding slightly. This amounted to several extra inches for each five foot cable length. Noting the cable stripped below, you will see the two 16 gauge conductors, one in red dielectric, one in black. You will also see the mesh copper shield. For this particular cable, the mesh shield will be soldered to the ground on the source side and not connected on the other (floating shield configuration). Here is the opposite end of the cable after tinning the conductors. Tinning simply means covering the conductors with solder in this case. On this end of the cable, the shielding is not connected, so it is trimmed down and isolated with 3M electrical tape. Note that the black conductor (ground / return) is cut slightly shorter intentionally. Now we will be soldering the Cardas RCA connector to the conductors. This is done by removing the barrel of the connector, then sliding it over top of the cable with the tinned ends and lining them up with the appropriate solder terminals. The red conductor (signal) goes to the center pin and the black conductor (ground / return) is soldered to the inner barrel. The Cardas GRMO requires quite a bit of heat to ensure a proper joint. I find that a solder station with adjustable temperature is necessary. The joints should be strong and shiny when complete. Once the soldering is complete, the RCA needs ample time to cool (they will be extremely hot to the touch). Then the outer barrel can be screwed in place and 1/2" adhesive heatshrink placed on top to act as a strain relief. I tend to like to cover about half of the Cardas barrel with the heatshrink so that some of that shiny gold bling is still visible on the completed cable. 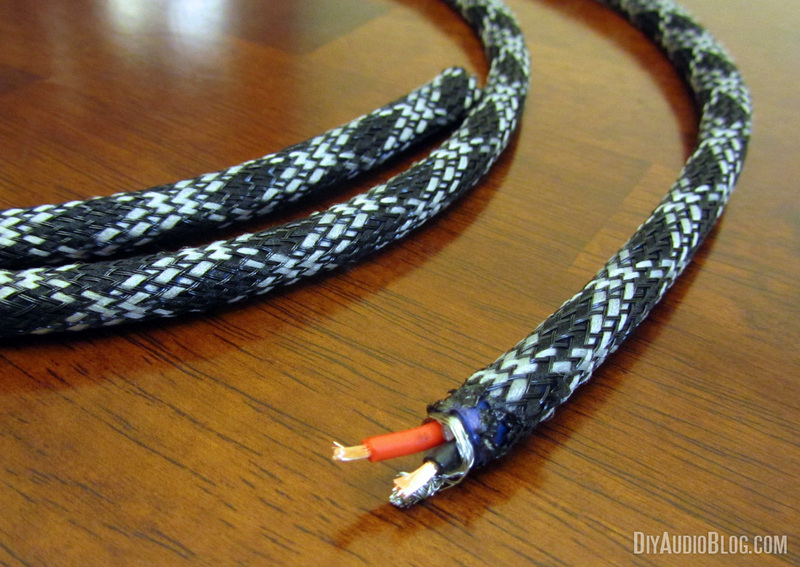 All that's left is heating up the heatshrink with the heat gun and we have a completed cable. 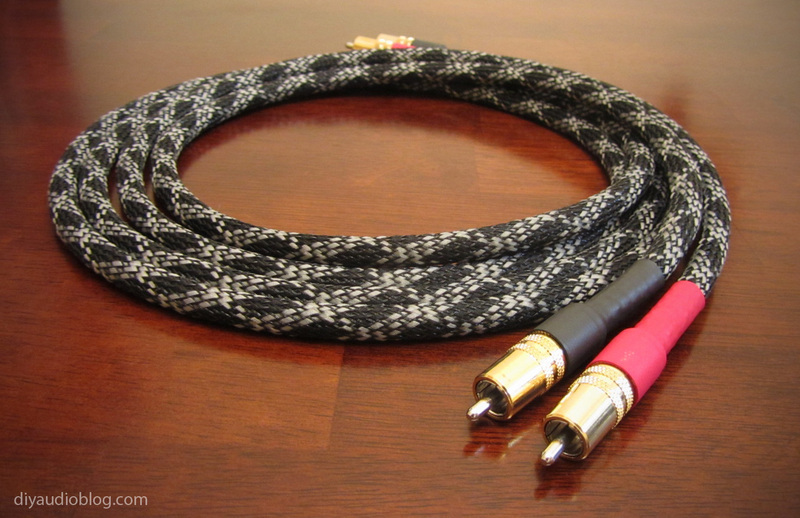 A second identical cable was made for the right channel and now we have a very fancy pair of subwoofer cables. Hope you enjoyed reading this post. 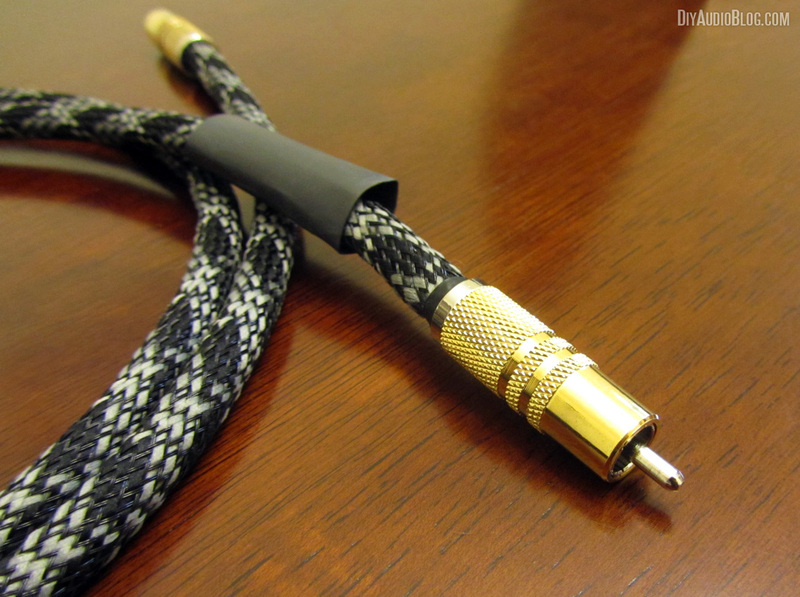 If you are interested in having your own custom subwoofer cable (or any other cable) made, please contact Zynsonix for a quote.